Last night, The Jinx ended its six-episode run on HBO. The documentary series came to a conclusion with a stunning sequence of events, building a tremendous amount of suspense: would the second interview with Robert Durst happen? What would happen in that interview? And what would happen after that interview, when Robert Durst will have been confronted by the second “Beverley” envelope? If you were watching live, the answers to those questions were an escalating series of events, culminating in a final scene that had me yelling at my television. 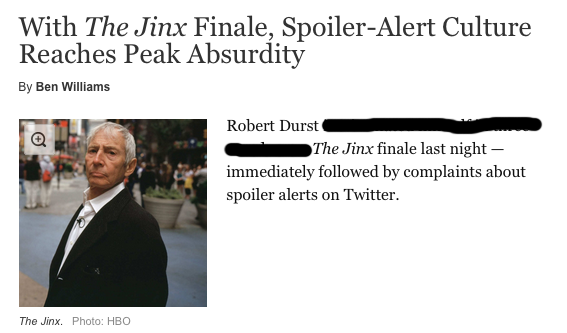 However, if you weren’t watching live, that yelling may have been directed at The New York Times, who pushed an alert to their app users and wrote a breaking news tweet quoting Durst’s words and promoting their reporting on their connection to Durst’s Saturday arrest in New Orleans. It could have also been directed at the various outlets—Vulture, Buzzfeed, etc.—who subsequently tweeted the news as news, all of whom fielded complaints about “spoilers” from Twitter users. Beyond the fact that I would contend Durst’s statements in the finale of The Jinx in no way constitute a “confession,” Williams’ point is well-taken: the fact that Andrew Jarecki’s documentary series is making a contribution to an ongoing news story independent from the series itself means that the New York Times reporting is less spoiling the series itself—which they clearly had advance access to, in order to support the reporting—than they are extending the series’ impact to a broader audience, most of whom did not watch The Jinx (which drew only 446k viewers in the first airing of last week’s episode). And yet while Williams’ distinction between a real life criminal investigation and Game of Thrones is valid, and would clear The New York Times in a court of ethics, I also think that the New York Times—and the other publications in question—could have crafted an equally provocative headline that did not actively spoil the events of the series’ final scene. I believe that the news could have been framed in a way that still broke the news in question without revealing in concrete detail the climactic moment of the series. As the penultimate episode of the season, “Blowing Smoke” has to do more than, well, blow smoke; while last season demonstrated the ability for a finale to offer an exciting climax without much direct plot momentum carried from the previous episode, the fate of Sterling Cooper Draper Pryce has been developing for a few weeks, and the worst thing that could happen is if its impact is lost. What’s interesting in “Blowing Smoke” is that the show mirrors its characters: still somewhat in shock from the new of Lucky Strike’s departure, they find themselves sitting around with nothing to do. They can’t bring in accounts thanks to concerns over their longevity, they can’t make dramatic changes without seeming to be in crisis mode, which leaves almost no options to feel as if they’re really making a difference. This episode is about that circumstance, what it drives Don Draper to do, and whether trading certain doom for an uncertain chaos is the right path to take – in other words, it’s about the danger of a situation where it’s not no, but it’s not now, and how a person like Don Draper lives within that liminal space. The answer is different depending on who you ask.